my shampoo of choice has to be lush BIG sea salt shampoo, which doesn’t necessarily make your hair resemble a glam rocker, but does make it gloriously clean and texturised. i tend to use it a few times a week, alternating with either john frieda full repair shampoo or that new l’oreal sulphate free range just so the salt doesn’t dry out my hair too much. if i’m feeling lazy, like can’t be bothered to use a treatment lazy, i’ll always reach for the body shop banana conditioner. i love this stuff! it even smells good and i can’t usually stand the smell of bananas. it makes my hair so soft and manageable, as it’s been quite knotty recently, so i’ve been enjoying using it. once i’ve towel dried my hair, i apply the tiniest amount of moroccan oil light* to the last third to help with split ends and really deep condition my hair. i know there are lots of variations of hair oil, but i do believe this classic works so well and smells quite lovely too! as for styling, i always reach for KMS paste up spray for volume as it’s literally amazing. it doesn’t make your hair feel horrible or crispy, just thick and volumised and just aaah i love it. same with the old favourite batiste dry shampoo. i know everyone’s tried it, but it does what it says on the tin and i always have a can in my collection. 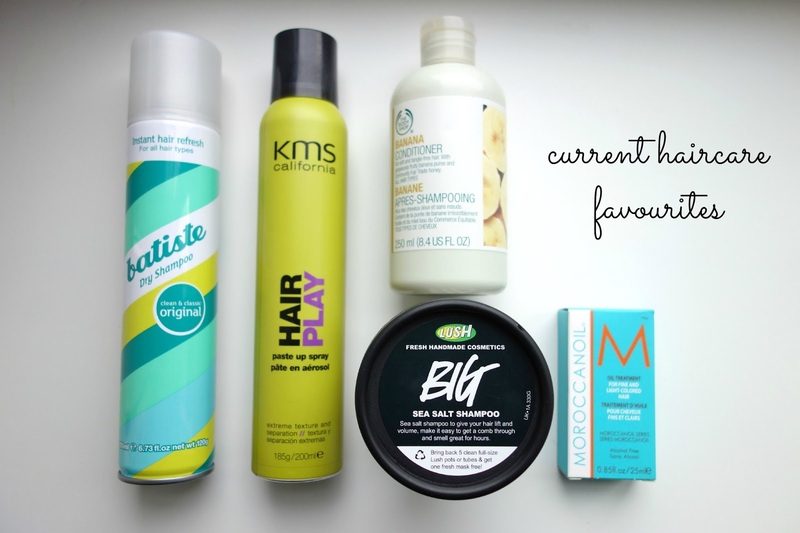 so, they’re the products i use on a regular basis to make my hair a bit better than it would be if i left it! honestly though, i am oh so very lazy when it comes to my hair yet people always ask me about my routine, so, well, there it is. bet you’re all disappointed haha. any hair care products you’d recommend to a lazy girl like me? let me know below! check out these two lovely blogs: novella afterglow and pierrelecat! and don’t forget to enter my Chanel cream blush giveaway!